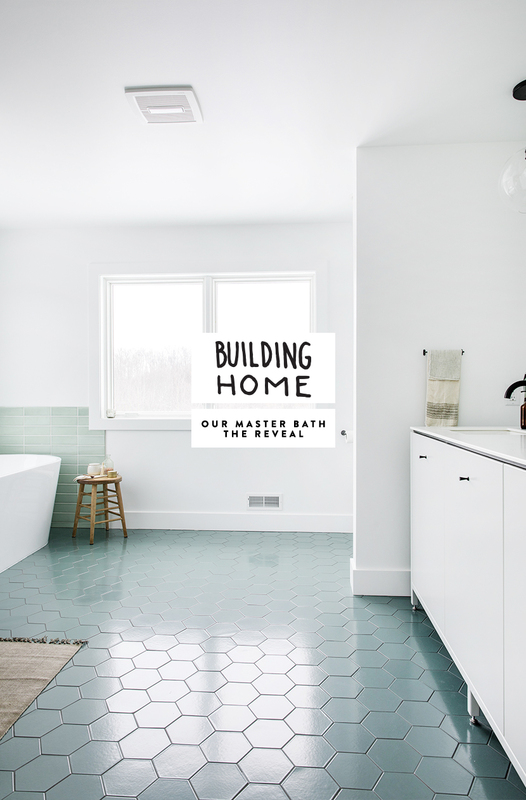 Building Home: Our Master Bath Reveal + A Surprise! Happy Wednesday! 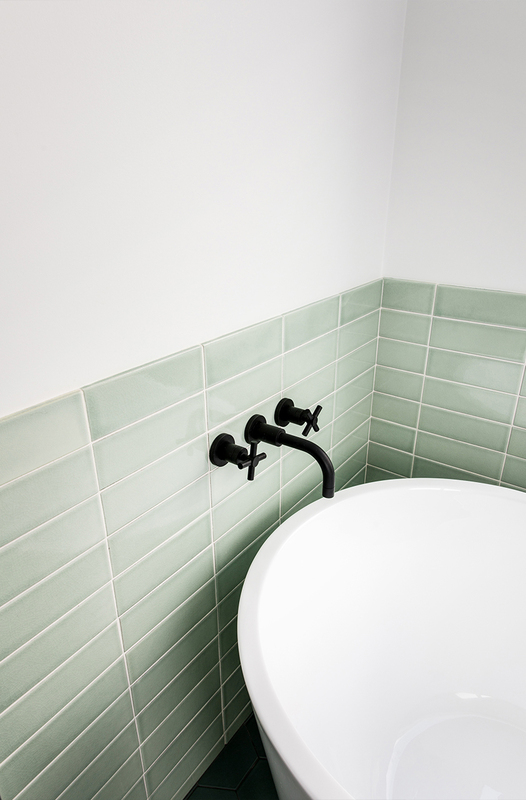 We have more reveals ahead of us with the house, but this is the last of our spaces that we partnered with Fireclay Tile on to create. This space, outside of our kitchen is hands down my favorite in our whole home. The relaxed and simple nature of this space is exactly what we were going for, but it also poised the most challenges out of any other space for us. Though Mike and I are visual people, it was difficult for us to figure out how to bring together different colors, textures, and patterns into one space that would feel cohesive, relaxing, and most importantly timeless. Thankfully we had the amazing team at Fireclay to help us see this come together just right. Though these weren’t difficult things, we were trying to do a lot with this space, which actually ended up being larger than we realized when working on drawings. One wonderful surprise! Throughout the promise of making this room come to life I probably spent the most time in here approving things. The tile job was the most intense one in our home. The others were more straightforward but with the number of color and styles going on I had to make sure we were available for approval. 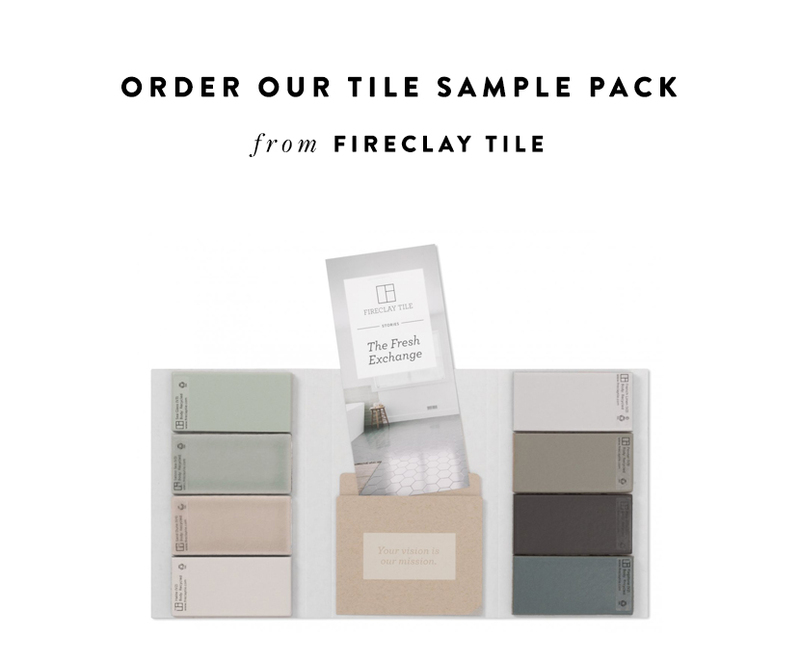 Fireclay tile takes about 4-8 weeks to receive as it is all made to order typically so if we had to rip things out at all we would be looking at a potential reorder so I wanted to make sure we were good every step of the way. Ultimately it wasn’t an issue at all and anything that popped up we solved on the spot with our installer. The space truly ended up involving everything we wanted. 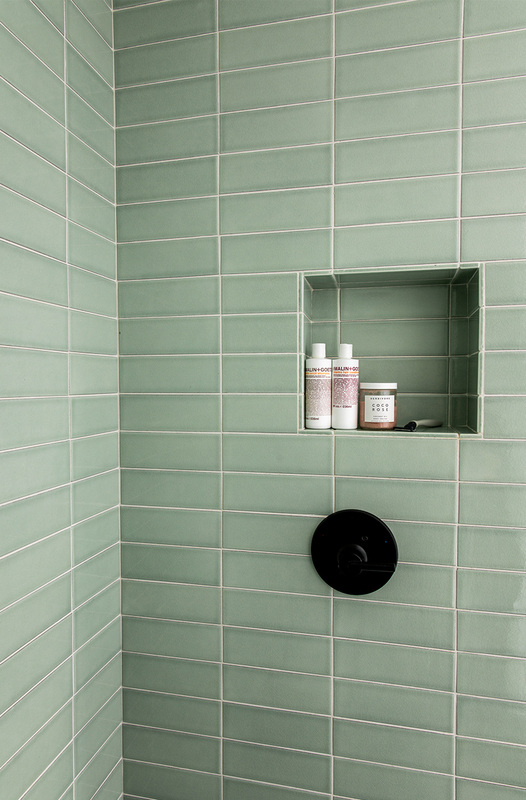 The color of the Flagstone and Salton Sea Tiles perfectly capture the colors of the lake through the season while still feeling muted, modern, and neutral. It continued the color theme through our home that we had hoped to make present. 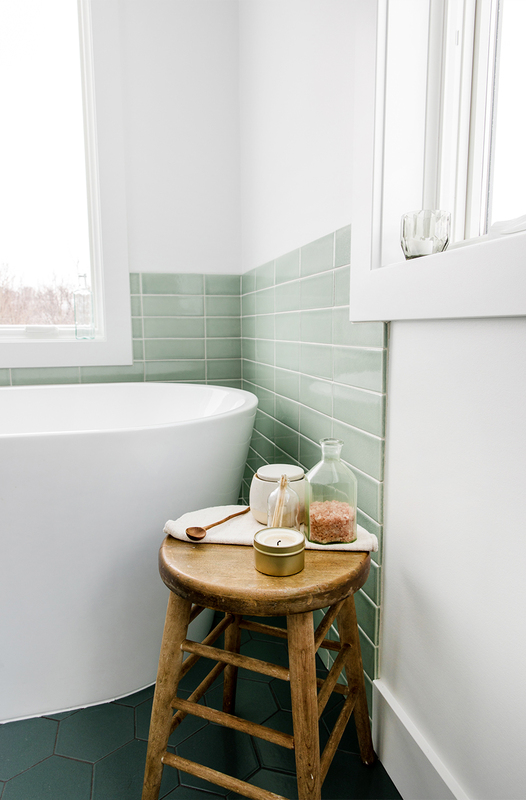 The simplicity allows for this space to take on the season with warmer towels for winter and lighter ones for summer. The windows allow tons of light in during the winter months and cool air from the lake during the summer. Never have I walked in here and felt there wasn’t enough light either. It is such a calming and relaxing room every time of day. The shower ended up being the right size and our favorite detail is separating the faucet handle and the shower head. This allows us to turn on the water, wait for it to warm, and never get wet in the process. A wonderful detail we are glad we made a priority. 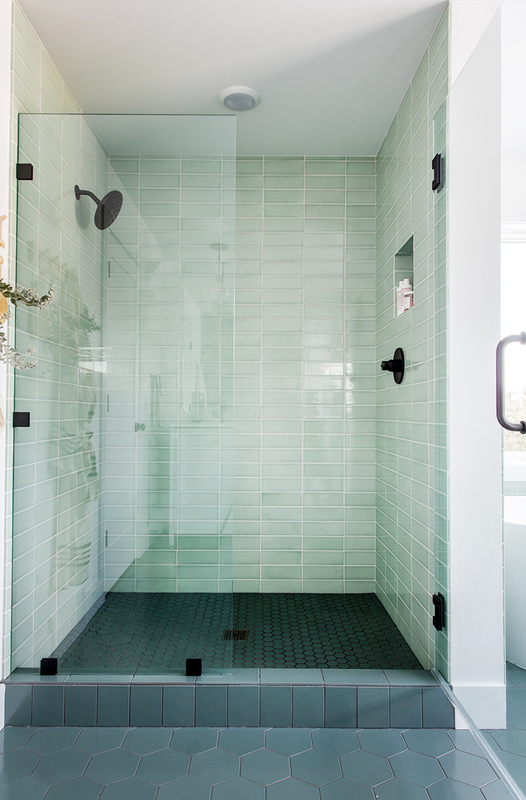 My one thing I do wish we had done is added the option for an overhead shower head as well since many times with this space being so large, if the shower is ever shared, it can feel like there isn’t enough water available. A small detail that for sure doesn’t ruin a space but something I would recommend if you have the opportunity to make the choice. We also loved the simplicity of the glass wall and door in this space. 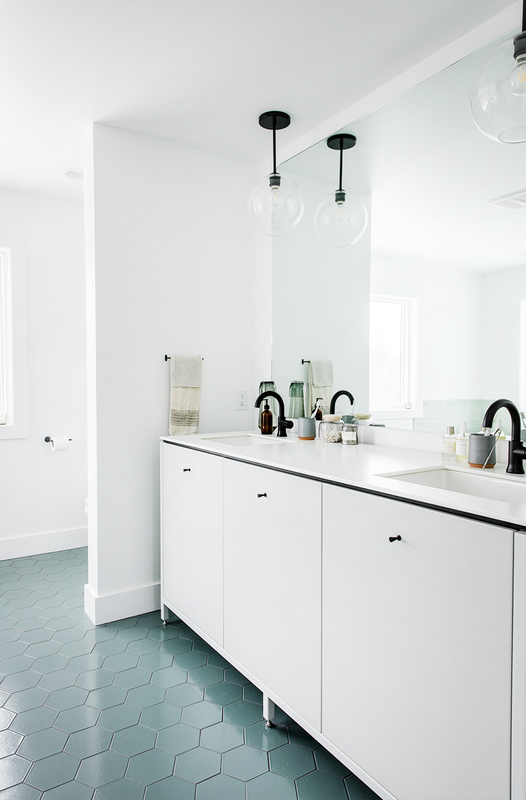 It was an affordable way to make the space feel even cleaner and modern. When planning out the tile, I found the hardest part of it all figuring out to progress the main floor to the shower floor. When I saw an image within a Schoolhouse Electric catalog of how they had just downsized the same floor tile onto the shower floor that solved it for me. 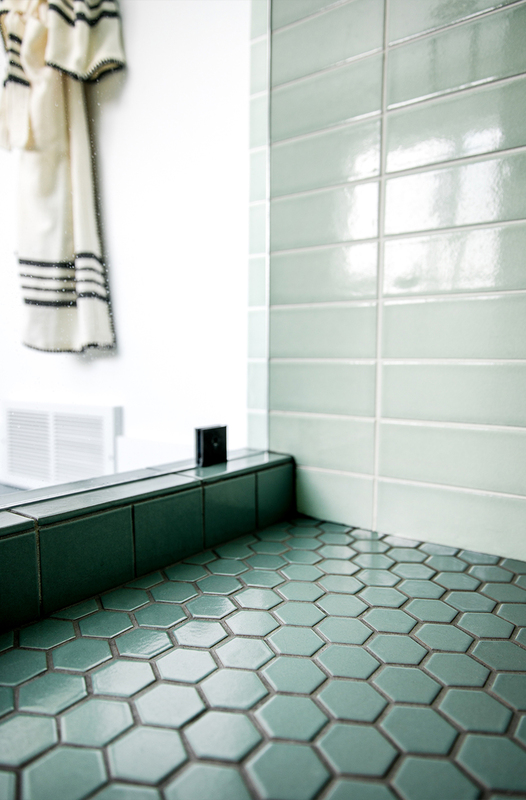 We simply kept the contrast low by keeping the floor tile all the same and used the squares to bring up over the curb and placed the 2″ hexagons inside the shower. This way we could keep the grout the same, limit the number of decisions and worries, and it basically all flows together without much notice. 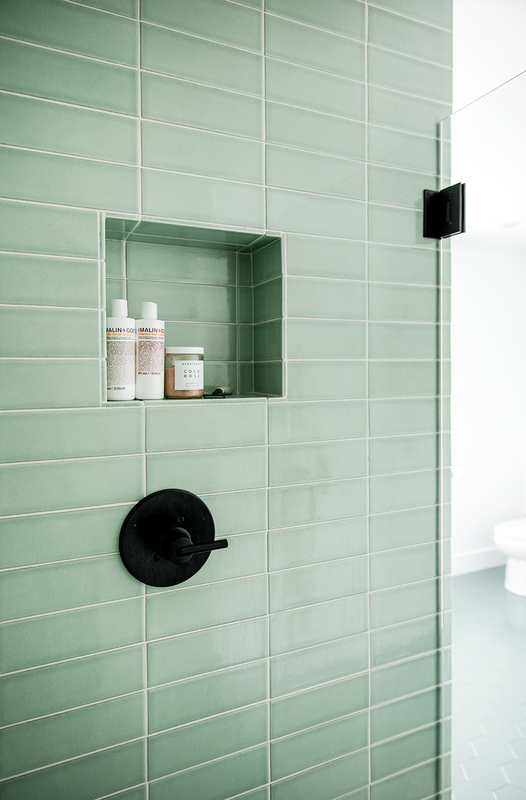 Since the hexagon is its own level of a strong pattern we wanted to keep the wall tile more minimal and straight so we went with the stacked look and couldn’t be happier with it. 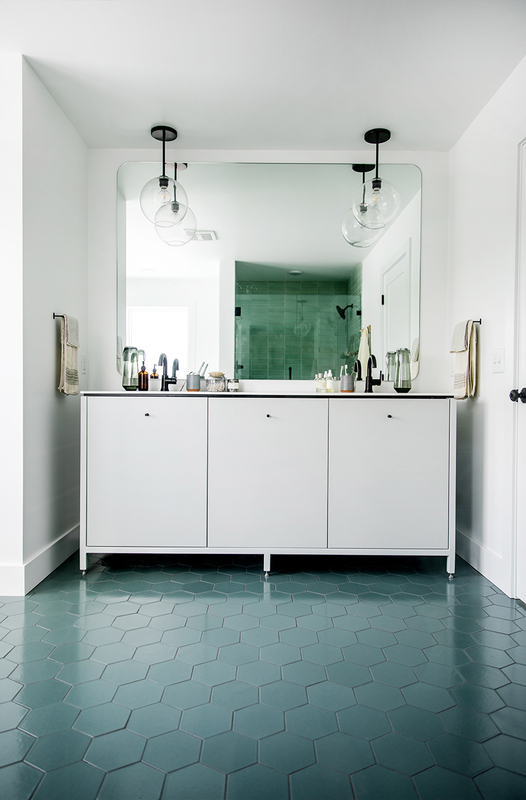 Since the tiles are handmade even with straight clean lines there are some imperfections that happen, but we I love how that adds character to the whole space. When I saw the shower come together my worries dropped significantly. I knew the tub would turn out just as we wanted as well. Though I debated about running the tile all the way up the wall, I felt it would be too much. I wanted the spaces to feel separate but cohesive. By doing a half way it makes the spaces feel together but separate at the same time. It ended up feeling really wonderful but providing the right amount of protection on the walls. So much of the inspiration for the space came from our times traveling and staying at so many spaces all over the world. 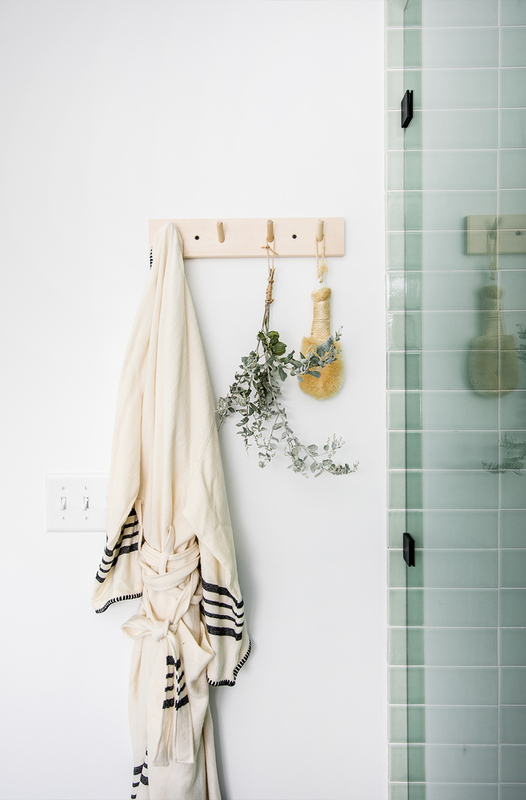 Since we knew that our world traveling days would be different when moving here and our life would slow in many ways, we wanted to make sure our home carried so many of those spaces in our life still. We brought the idea most to our tub area. We wanted it to feel serene and like a spa. With the windows all around this space you can sit here and watch the snow fall, the leaves change, and the days pass whether in the day or evening. It is truly one of the most relaxing spaces I have ever had in a home. Though I am not a bath person. This tub has made me so. 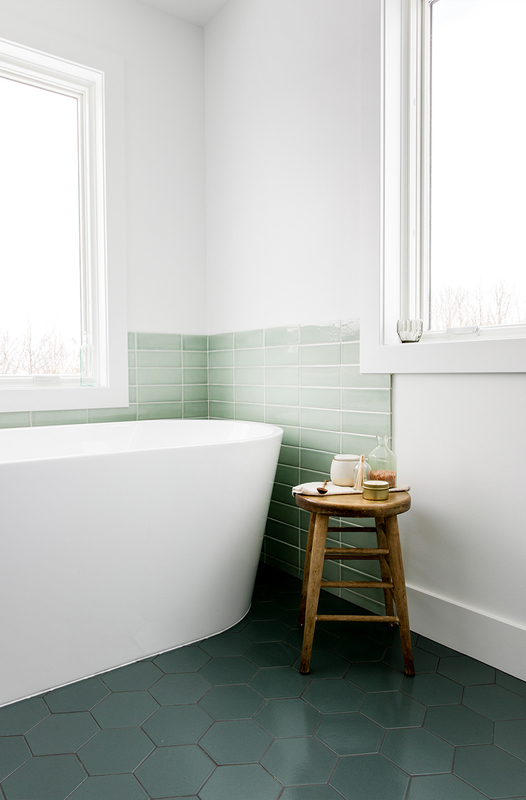 The tub isn’t too large but it easily fits Mike and I or offers a different place perfect to bath Hayes some nights. Many people recommend to us to do a full wet area with a tub and shower combined, but since our space was so large and our winters are so cold, I felt concerned this space would feel cold in the winter when we would want it the warmest space. Since we don’t have radiant heating I believe this would have been true particularly now with how cold our shower can even feel at its size before the water warms it up. Instead, I feel the warmth of this space is rather perfect now this way. I also was concerned about a wet space with Hayes. Even though this is our bathroom, every parent knows your bathroom is never FULLY your’s. He is in here often and we have had to teach him to stay out of the shower especially after it has been used because of slipping and sharp edges so the idea of a full wet space just sounds like more of a headache with toddlers. One thing I didn’t know we could do was actually have different types of brand faucets in the space. 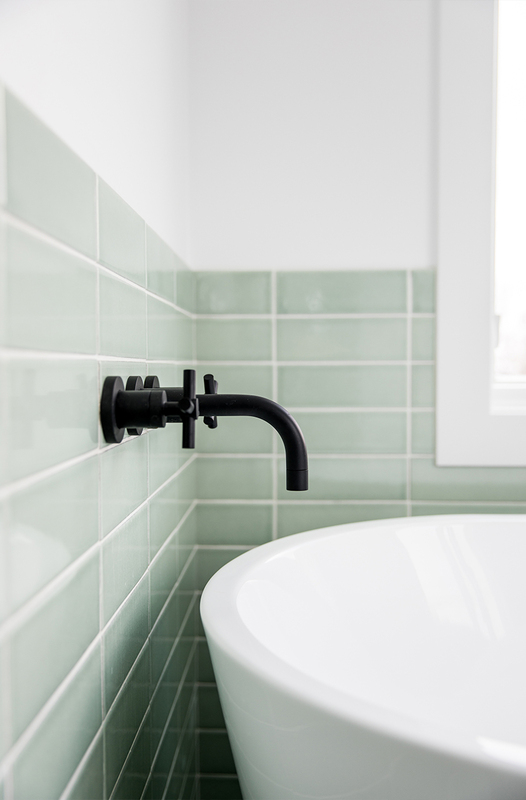 I had a very specific vision for our tub faucet and Delta Faucets didn’t carry what I wanted so we invested a little more and went for a Newport Brass faucet in matte black. It is beautiful, simple, and just what we wanted. I loved how the shape of the iller matched everything else we did in our home, but fit the design I wanted. Something to think about with your design if you have a specific style you are going for. Since Delta was a more affordable option with the design we wanted, it allowed us some room to invest here. Even though I would have loved to go with more expensive fixtures, I loved we could invest in certain ones that mattered the most to us. FINALLY! The surprise! 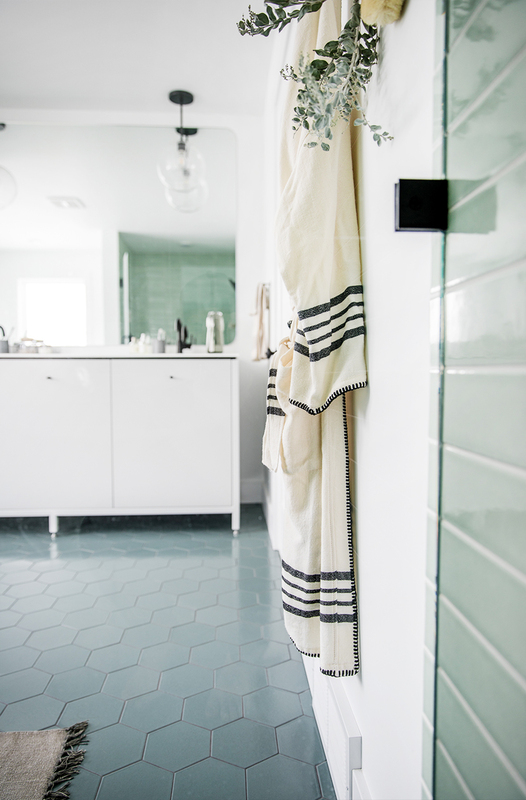 Through this whole process we have worked with Fireclay Tile to create these amazing spaces we get to enjoy now and they have created a full interview and Tile Story all our around our home in partnership with me. I love Fireclay not just for the beauty of their products, but what they stand for as a B-Corp company making their product in the US, recycling materials, giving back, and taking care of their employees. They are amazing at what they do especially in the realm of home products! 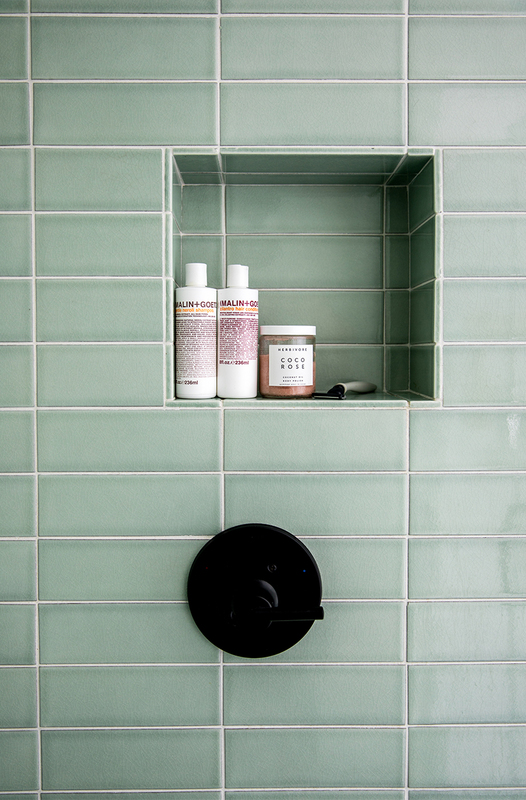 That said, you can order a full sample of tiles inspired from our home that I put together with them if you are looking for a palette for your home. 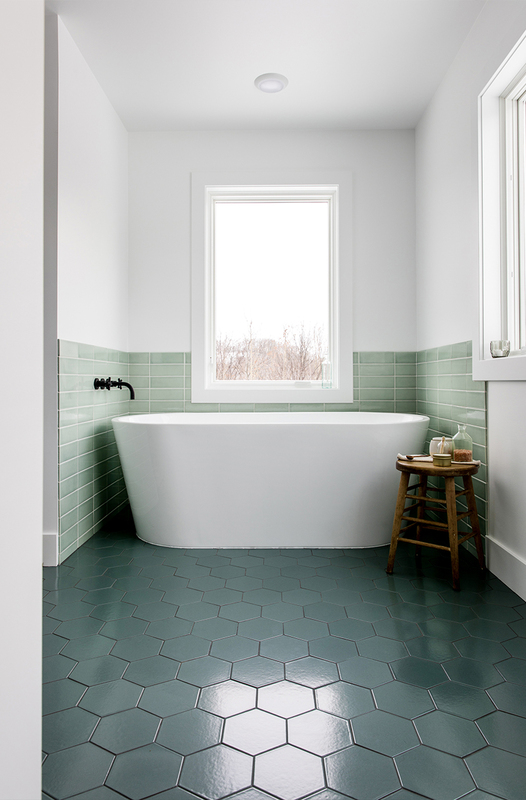 I am so excited to have done this with them and you can hear more about my design process and see more inspiration here on their Stories page today as well as order a sample pack of my tile choices from our house to get you inspired for your home and renovations. 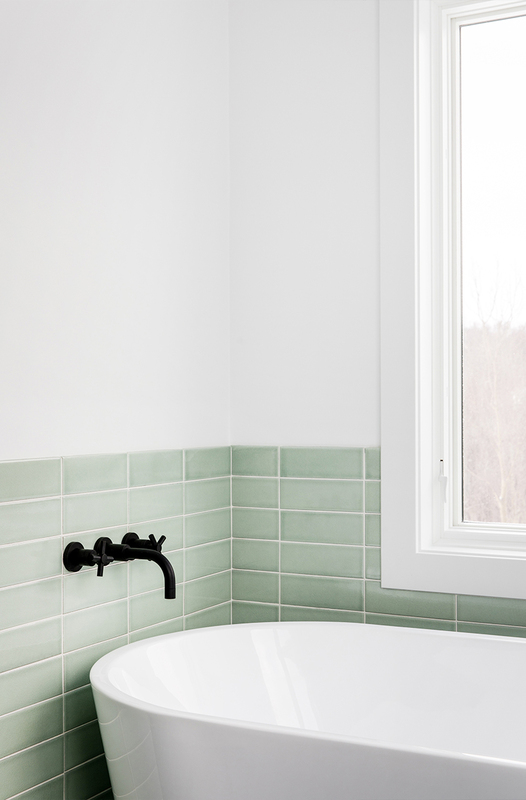 Please let me know about any questions you have and what I can do to help you through the process of designing your bathroom. Below I have a list of sources for you so you can find similar products. A beautiful space! And indeed quite serene. The influence of the lake is apparent. Well done, i’m so envious. It is all so beautiful! My goodness, your bathroom is beautiful! 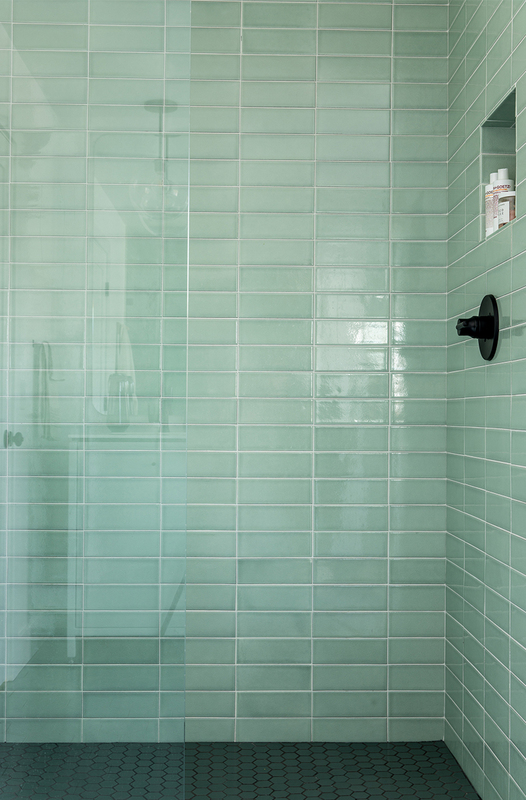 The tile color is so relaxing, reminds me of the sea “- ) what an inspiration you are for me! Thank you! I said it on Instagram already but I have to say it again on here, that stool! I am so in love. I love the entire room. Your house is my dream house, the simplicity and functionality. It’s perfect. The most gorgeous bathroom! Its like a spa, but better. Bravo, Guys! Wow. SImply breatHtaking. Rea love that green.